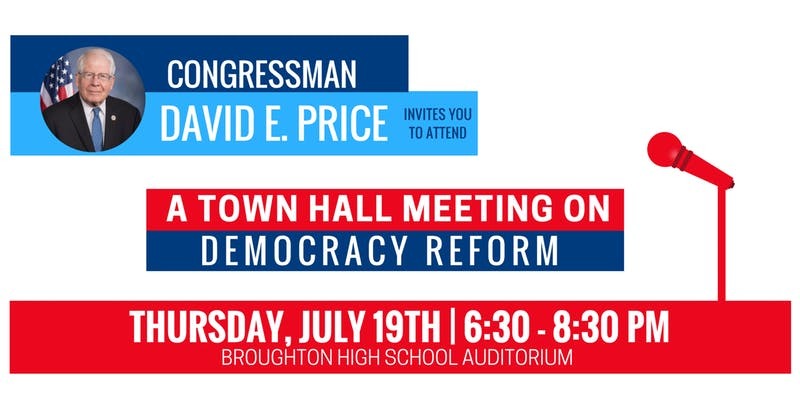 Organizers expect a big crowd tonight for a “democracy reform” townhall meeting featuring Congressman David Price that will take place at Broughton High School in Raleigh. The event, which features the moniker “A Better Deal for Our Democracy,” will take place from 6:30 – 8:30. The event website says that those in attendance will receive a congressional update from Price on issues like “extreme partisan gerrymandering and attacks on voting rights to foreign interference in our elections and rampant corruption in Washington,” hear from local advocates about the democracy reform agenda in North Carolina, and get a chance to offer their own thoughts and ideas for solutions to the challenges facing our nation. Attendees will also discuss the road ahead in light of recent developments such as the Supreme Court’s redistricting rulings and the General Assembly’s proposed constitutional amendments. Click here for more information and to RSVP.